Bugey’s vineyards total 500 hectares between the Jura and Savoie regions (Ain ‘department’). It’s a small yet richly varied wine area. 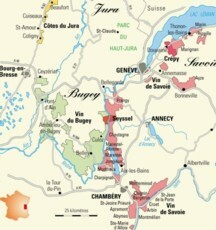 It includes the Bugey (red, white and rosé) and Roussette du Bugey (white) appellation areas. The wines are single varietals – except Cerdon based on Gamay and Poulsard. The varieties are as follows: for reds, Mondeuse as well as ‘imported’ grapes Pinot Noir, Poulsard, Gamay and Pinot Gris (actually pink skinned). For whites the local varieties: Altesse, Jacquère, Molette, Mondeuse Blanche; and ‘imported’ grapes Chardonnay, Aligoté, and Pinot. Besides the Bugey appellation area, you’ll also find Bugey Manicle (white and red), Bugey Montagnieu (red), sparkling or slightly sparkling Bugey (Montagnieu for white and Cerdon for rosé). For the Roussette du Bugey appellation, you’ll also find white Montagnieu and Virieu le Grand. Brillat-Savarin used to have a vineyard in the Manicle area, but this wine almost disappeared before being put back into production. It’s a wine for keeping. Cerdon ‘méthode ancestrale,’ made using a very old method that gives its unique colour, has also been restored to former glory by a handful of growers (Renardat-Fache on the photo). The Savoie vineyards stretch across the ‘departments’ of Ain, Isère, Savoie and Haute-Savoie. These are still wines but the Ayze ‘cru’ labelled as AOC Vin de Savoie is sparkling. There are also the ‘Vins de Pays’ (‘country wines’) from Allobrogie and Coteaux du Grésivaudan. The Savoie Coomb (or Glen) and Chambéry Valley: the largest vineyards. Within AOC Vin de Savoie, the ‘crus’ sites Apremont, Abymes and Arbin. The names Apremont and Abymes (literally harsh mountain and abyss) recall the memory of Mont Granier, which caved in in 1248 killing more than 1000 people and creating a cliff-face 800 metres wide and 900 metres high. Around Lake Bourget and the town of Aix-les-Bains: AOC Vin de Savoie with the ‘crus’ sites Monthoux, Chautagne, Chignin et Jongieux. AOC Roussette de Savoie and Seyssel. Frangy where the famous Roussette de Savoie is made. AOC Vin de Savoie with the ‘crus’ sites Marignan, Marin and Ripaille. AOC Crépy and, not far from the valley of Arve and Bonneville, wine from Ayze. Worth visiting: ‘Musée de la Vigne et du vin’ (Vine and Wine Museum) in Montmélian. Recommended reading: "Les Vins des Terroirs de Savoie" André Combaz published by J.P. Taillandier (in French).